Cumin is a seed that has been used throughout history and it continues to be very beneficial today. Cumin makes a great tonic for the body even if you don't have a specific ailment to cure. It is said to increase the heat in the body thus making metabolism more efficient. It is a stimulating, bitter and warming herb that is great for support to the digestive system and to help relieve dyspeptic headaches, nausea, morning sickness, colic, and flatulence. It has been used to relieve indigestion, relieve pain, alleviate abdominal bloating, cramping in the abdomen and distention. Anti-microbial properties in Cumin seed help in getting rid of worms in the intestines and parasites. It has also been shown to boost the power of the liver's ability to detoxify the body. The seeds themselves are rich in iron and are thought to stimulate the secretion of enzymes from the pancreas which can help absorb nutrients into the system. Recent studies have revealed that Cumin has anti-carcinogenic properties that reduce the risk of stomach and liver tumors. Externally, Cumin helps to treat skin problems such as psoriasis, eczema, and dry skin and even gets rid of wrinkles. It can treat other skin issues as well, it has been found to be helpful for burns, acne, and boils. Antiseptic properties found in Cumin seed extract can help fight viral infections such as colds by boosting the immune system. Cumin seed is rich in antioxidants and has strong anti-tumor properties. Cumin seeds are used as a natural medicine in the treatment of asthma. Some of the components in Cumin tinctures have a tranquilizing effect and may act as a relaxant. It is helpful for strengthening nails and hair, giving the hair a healthy sheen and getting rid of dandruff. Gargling with Cumin seed extract in a mouth rinse helps to keep the mouth fresh, heals ulcers, and reduces the foul smell. Massaging the gums with it can also help to prevent bleeding gums. The vapors can be inhaled to help relieve sinusitis. Research has shown that the natural chemicals contained in Cumin seed extracts can reduce blood sugar levels and improve the action of insulin. Cumin is extremely beneficial for digestion and digestive problems. Just the smell of it can activate the salivary glands in our mouth, facilitating the primary digestion of food. Another compound present in Cumin seed is Thymol, which does the same thing to the glands that secrete acids, bile, and enzymes, responsible for complete digestion. Cumin is a carminative that can relieve you of gas troubles and thereby improve the appetite. It can help with flatulence, indigestion, diarrhea, nausea, morning sickness, and atonic dyspepsia. The presence of essential oils in the seeds of cumin is comprised mainly of Cuminaldehyde and certain pyrazines, which act as a natural laxative helping to relieve constipation. Constipation is one of the main reasons behind piles, added with infections in the wound, it helps to heal up the infection or wounds in the digestive and excretory system. Common colds are a viral infection which affects the body frequently when the immune system is weak. Mixed with honey and garlic, it is an excellent remedy for enhancing immunity during cold and flu season or when infection is setting in. It is said to relieve the symptoms of the herpes virus, allergies, hay fever, and general respiratory problems (pulmonary diseases due to cold weather, shortness of breath, respiratory failure), the common cold symptoms, such as a cough, earache, congestion (excess mucus), and runny nose. Cumin seed extracts are a natural medicine for treating asthma. Cumin is rich in iron and vitamin C, which is essential for good immunity. Children, teenagers and adult women going through their menstrual cycle and women that are pregnant or nursing need to consume more iron and Cumin extract is an excellent source for obtaining iron. Cumin supports a healthy prenatal development and is believed to make childbirth easier as well as improve the milk supply of nursing mothers. In addition to its nutritional components, it contains carotene, essential for infant growth. During toddler years, Cumin provides children with the energy required for every stage of their active life. Regular use has a strengthening effect which can decrease the length and severity of natural childhood illnesses, especially when it is cold and flu season. These energy giving effects are also an ideal supplement for the elderly. In fact, it is a good tonic for boosting memory, intelligence development or lack of concentration, and may speed recovery from amnesia, when consumed with honey. Combined with a ripe banana at bedtime, it is said to induce peaceful sleep. Aside from its antibacterial and antifungal function, it has anti-inflammatory and analgesic effects that may be helpful for treatment of rheumatism, to effectively reduce inflammation associated with arthritic disease and related inflammatory diseases. Cumin also has a remarkable amount of calcium which accounts for more than 90% of our daily requirement. It has also been employed in the relief of the temporary discomforts caused by carpal tunnel syndrome and has been used for headaches, migraines, nervous exhaustion, muscular aches and pains and toothaches. Cumin is currently being studied for its possible anti-carcinogenic and antioxidant properties. Cumin seeds are rich in antioxidants like eugenol and limonene which have strong anti-tumor properties. The detoxifying properties accelerate the secretion of enzymes from the glands, as it does other secretions. As well as vitamins, A and C that are in that has numerous other benefits. Healthy immune systems detect and destroy cancer cells helping to prevent destructive, free radical or oxidative damage before it starts endangering tissues and cells. This herbal supplement does this by increasing production of immune cells, bone marrow cells, and B-cells that produce antibodies. Extracts of Cumin seed have also been shown to modulate production of interleukins, and it shares these qualities with Astragalus, Cat's Claw, Mistletoe, Ginseng, and Garlic. Cumin stimulates energy and helps in recovery from fatigue and low spirits. The phenomenon of this is that it is very effective for enhancing insulin sensitivity significant in the treatment of Diabetes Mellitus. Cumin's anti-glycation properties have proved useful in animal studies to reduce total triglycerides, cholesterol. and pancreatic inflammatory markers. It also prevented excessive weight loss. It is also helpful in preventing and lowering high blood pressure and in the treatment of heart disease and other inflammatory diseases. Cumin tincture contains a good amount of iron an essential element for the formation of hemoglobin in the blood required for the transport of oxygen and whose deficiency causes anemia. Additionally, these oils help in the removal of toxic substances and foreign matter, such as microbes, from the body. The essential oils present in the extract has disinfectant and anti-fungal properties. Regular use may help the body keep free of any microbial or fungal infections, such as acne, boils, rashes as well as burns, insect bites or stings, sunburn and other skin ailments. Cumin herbal extract in it's concentrated form is effective in combination with antibiotics to add additional antibacterial function to kill a staphylococcal infection, E. coli, and candidiasis, (Candida Albicans). The components in Cumin seed extracts are good for detoxing, helping to remove toxins from the body, through the excretory system, and not through boils. Cumin liquid extract, used externally in an oil, salve or cream, helps to treat eczema, psoriasis, and dry skin. Rich in vitamin C and vitamin E, use it with coconut oil and olive oil and leave on the skin for one hour to eliminate wrinkles and help to keep the skin young and glowing. Cumin tincture is also beneficial in fighting hair loss or for treating total or partial baldness. Also, for treating brittle, split ends, it restores shine and beauty to the hair. Cumin seems to have a healing power for the kidneys, as well, it has shown that is is a strong antioxidant that preserves the activity of prevents the energy decline of the kidneys, typically associated with aging. It expels the kidney stones and urinary bladder stones if taken in a syrup with honey. It is effective in the treatment of jaundice when taken with milk. When combined with Caraway it can provide an effective remedy for the treatment of renal colic. 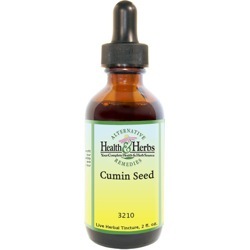 As a warming, aromatic herb, Cumin has been used as a stimulant to the sexual organs. Some studies have shown it has the ability to increase male sperm count. It has also shown promise in increasing breast size and has been used to reduce swellings of the testicles and breasts. Ingredients: Cumin Seed, Structured Water, 20% Alcohol. Non-Alcohol: Cumin Seed, Structured Water, and Vegetable Glycerin. Contraindications: There appears to be no warnings or contraindications with the use of Cumin seed. The oils contained in the herb may make the skin sensitive to sunlight. And Cumin seed may cause low blood sugars.